The Domaine Rouvre Saint Leger was born from a shared dream by Adrien Borrelly and Didier Dumont: the quest for the typicity of the terroir. To achieve this goal, we have selected 3ha from the 60ha Borelly’s family domaine, chosen for the nature of their terroir, the quality of their varieties and the exposure. These three little hectares allow us very detail oriented work at each stage of the vine and wine cycles. We are going to focus our efforts on it to capture its essense. Adrien Borrelly is 24 years old. 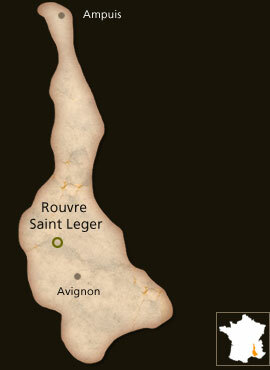 He is from a family of vigneron that settled on the Domaine de La Rouveyrolle in Laudun since 1683. Twelve generations after studying oenology, he decided to start his quest for excellence on the family domaine, selecting the best plots for each varietal. His goal: to extract from his terroir and the Rhone varietals the most beautiful expression of their typicity. Didier Dumont Murzilliis is 52 years old. Inhabitant of Avignon from Italian origin, he settled in the village of Laudun, and at the farm Saint Leger, to restore this building from the XVIth Century, and give it back it’s winemaking purpose (separated from the vineyard in 1980). After an international carrier, including 15 years in South America, he followed closely the expansion of the new world wines and got convinced that French wines had to enhance the typicity of the terroir to compete with the standardized varietal approach. Adrien and Didier have put in common their passion for wine, the quest for harmony, family tradition and international business expérience to establish Rouvre Saint Leger as a leader in Côtes du Rhône Village Laudun. In the heart of the Southern Rhone region, on the right bank of the river Rhône, the terroir of Laudun is characterized by its pebble stones that keep the heat of the sunny provence and give it back at night. The old vines are going deep into the ground for their water needs, capturing the minerals from the plateau of Mont Jupiter. On top of this great soil, the appellation is beneficiating from 3000 hours of sun a year and a wind that blows for 160 days per year, including 100 days with wind speed in excess of 60km/h. Difficult for the human beings, the Mistral plays an important role to dry the vineyard after storms, allowing a great condition. Rain falls are limited to a 700mm per year. With yields limited to 40 hl/ha, the stony soil allows the vines to produce quality grappes. Out of the 60 ha, we have selected 3ha from the best parcels on the side slopes with a northern exposure, facing the wind, on a terroir favorable to the chosen varietals: Syrah and Grenache for the reds, Viognier and Roussanne for the whites. Our method is meticulous from the labor in the vineyard, where each vine is monitored to the winemaking and aging in barrels. Total production is limited to 1250 cases (1030 in red and 215 in white), rare in quantity and quality. A pretty red/purple color with mauve glints. A discrete bouquet of red fruit and wild cherry preserves. The palate is superbly creamy, with strawberry zabaglione dessert aromas and raspberry with blackthorn fruit. Hints of spices, of oregano and herbes de Provence. Varietal: 60% Grenache; 40% Syrah Vine age: 30 years Terroir: Mainly sandy clay with pebbles. Northern, hillside exposure. Climate: Mediterranean, light precipitation, abundant sunshine and Mistral winds. Yield: 40 Hl/Ha Cellar: Manual harvest in crates. Partial destemming. Temperature controlled fermentation for 25 to 30 days. Manual pigéage [punching down] and rack and return fermentation. Partial maturation in barrels for 11 months. Bottled on April 30, 2010. Beautiful, pale yellow color with green glints. A bouquet of apricot, lychee and orange rind. This vintage is fresh and creamy on the palate, with hints of exotic flavored candy. Varietal: 100% Viognier Vine age: 25 years Terroir: Sandy clay with pebbles. Northern, hillside exposure. Climate: Mediterranean, light precipitation, abundant sunshine and Mistral winds. Yield: 40 Hl/Ha Cellar: Manual harvest in crates. Direct pressing, cold raking. 75% of fermentation in vats at 57°F, 25% in casks with stirring. Bottled April 23, 2010.